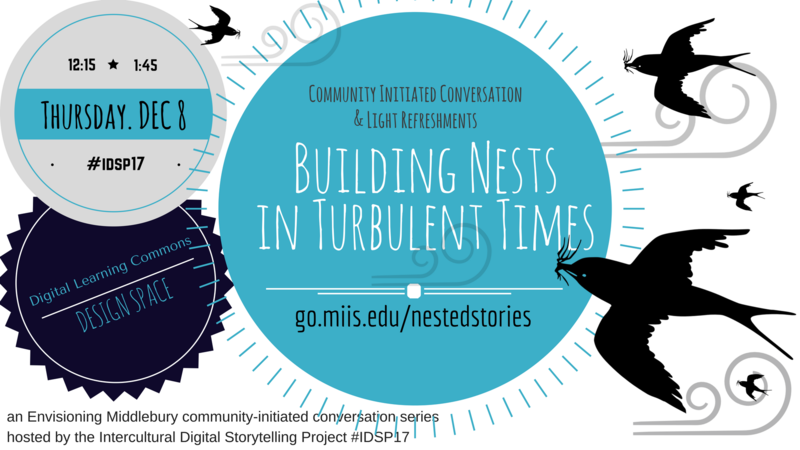 The Intercultural Digital Storytelling Project #IDSP is excited to be hosting a series of community-initiated conversations this Fall term. 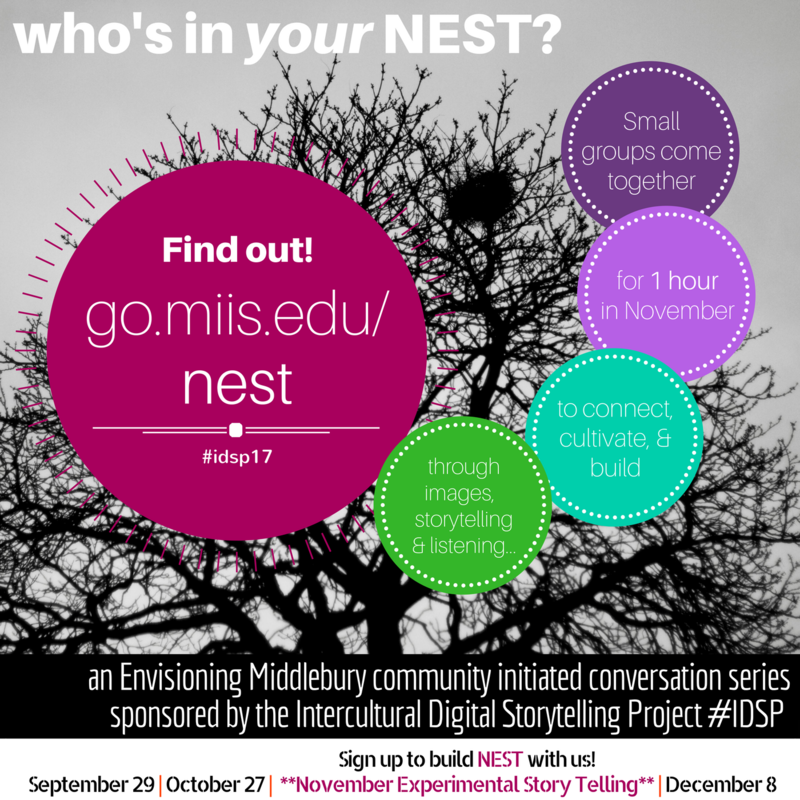 #IDSP was launched two years ago in 2014 as an experiment in digital storytelling. 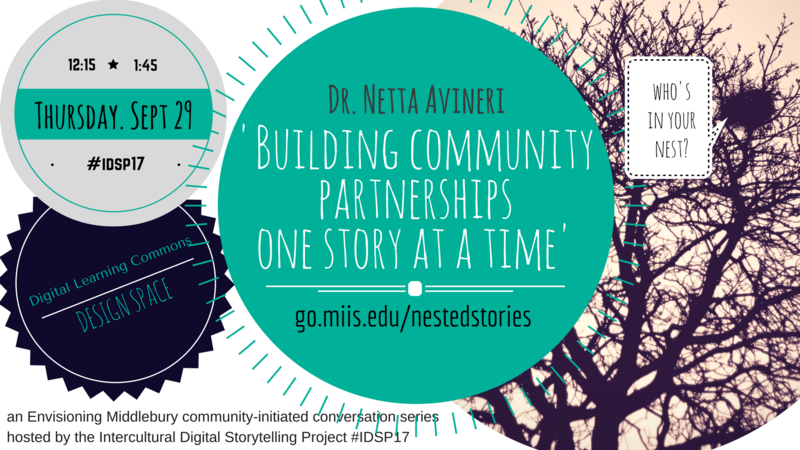 You can participate in one or more of the #nestedstories events – participation in all of them is not required. Each session will be independent, but all are connected to the others through the IDSP pillars: immersive learning, inductive research, peer mentorship, reflection, & digital media. Members of the community organize and hold their own discussions. Organizers choose the format they prefer, from a single hour to a daylong retreat to a series of meetings. These community-initiated conversations center on any topic or topics, and are intended to provoke thoughtful discussion around an issue of broad importance, a particular theme or opportunity, a challenge that confronts us. To include these conversations in the strategic planning process, organizers document them in a summary report in some form, written or recorded. Scheduled events will take place during Institute “community hours” in the Digital Learning Commons Design Space at 420 Calle Principal. So much of what we do at Middlebury Institute involves mutually beneficial partnerships with local and global communities. In this opening session we will explore the concept of “nested interculturality” and discover how individual and communal storytelling can play a key role in the ongoing creation of these partnerships. Participants will explore various modes of storytelling that they can then use in their personal and professional lives. During this interactive session we will explore storytelling as a technology for developing empathy and insight. Through a variety of storytelling exercises that can be used or adapted in a variety of contexts, participants will consider a number of underlying concepts, questions, and critical dispositions that have surfaced through the project while looking back at stories generated by the first cohorts of IDSP fellows. The end of the semester is approaching, the pace continues to quicken, and the election was only a month ago. How might we as a community carve out the necessary space and time to reflect & reach out to one another about those issues that are on our mind? How might we cultivate our own & others’ growth to deepen meaningful connections? Whose responsibility is it to facilitate these needed & necessary conversations? 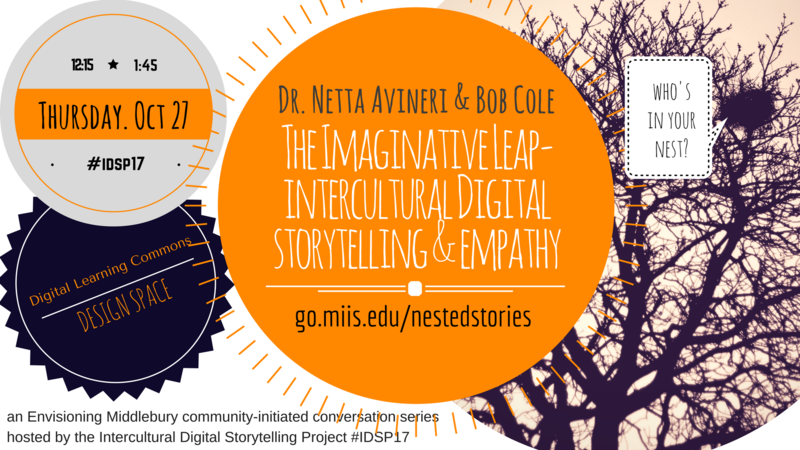 During this final #nestedstories Session of the Intercultural Digital Story Telling Project’s (#IDSP) Community Initiated Conversation, we will share stories & images in a collaboratively constructed space of exploration & discovery. 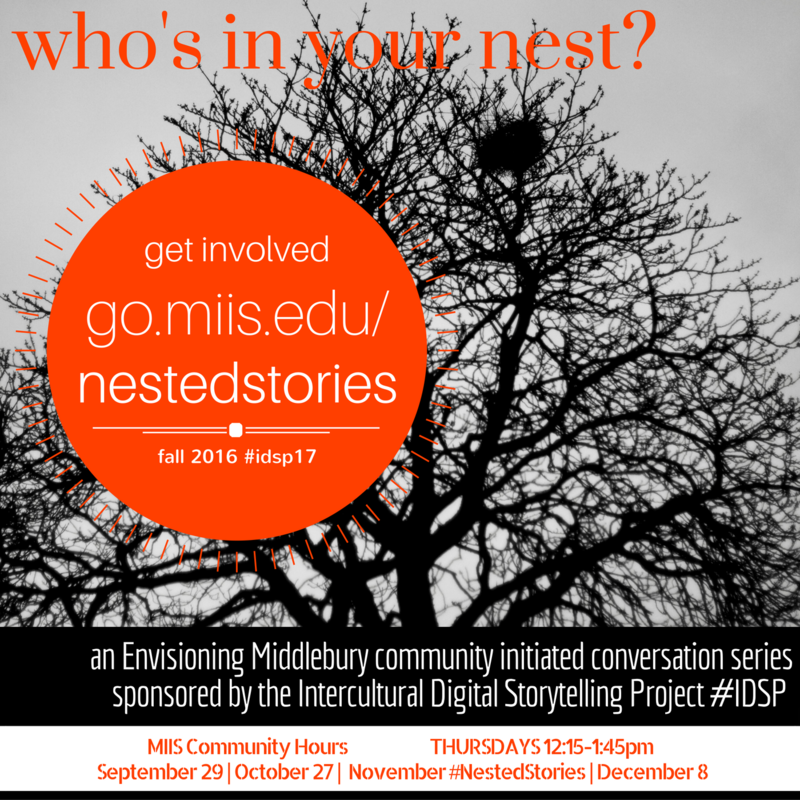 Participants in the NEST (November Experimental StoryTelling) sessions will share their experiences as storytelling experimenters. A Storify will be created based on tweets shared by participants at the session. Light refreshments will be provided. All are welcome! Visit the image gallery from NEST.